On Friday I gave two talks at the UK's leading anti-ageing conference, FACE. This year marks eight years since I was first introduced to the medical aesthetics world. Back then, FACE was held at the Royal College of Physicians and it was such a small industry that everyone knew everyone. Nutrition was nowhere to be seen! I was working in sales and marketing for a medical nutrition lab. I never would have imagined then that I'd end up speaking at the conference or charing a session entirely dedicated to nutrition and internal anti-ageing. It's great to see the industry embracing a more holistic approach to ageing. One of my talk topics was fasting. New research into fasting is turning traditional nutrition advice on its head. Recommendations to always have breakfast, eat little and often and never go hungry are being strongly challenged by leading experts in diet and health. We're now learning that going for extended periods of time without food can provide a wide range of benefits. Fasting has been shown to promote health and longevity by reducing numerous disease risk factors and promoting cellular regeneration. When carried out in the right way, fasting will not automatically result in a reduced metabolic rate or rebound weight gain as once believed. Time restricted eating involves restricting food intake to a limited period of time during the day, typically eight hours. This style of fasting is designed to be practiced daily, on an on-going basis. Research has demonstrated time restricted eating to be clinically relevant for preventing and treating obesity and metabolic disorders, including type 2 diabetes. In one study, overweight individuals had their daily eating window reduced from over 14 hours, to between 10–11 hours daily for 16 weeks. Their body weight reduced and they reported being energetic with improved sleep. Time restricted eating doesn't require calorie restriction or going for extended periods of time without food. It particularly suits individuals who don't have a natural desire to eat breakfast. Those who are used to eating breakfast first thing may experience hunger initially, if they choose to delay eating in the morning. It can take some adapting to for people who graze throughout the day, from morning until night. Consume all food during an eight hour period every day. For example, eat between 11am and 7pm then between 7pm and 11am, consume only water. Some individuals choose to skip either breakfast or dinner, eating just two substantial meals per day. Others consume three meals per day within a shorter timeframe than usual. Consider daily routine and personal preferences in order to find a timeframe that works for the individual. Intermittent fasting involves alternating 24 hour periods of fasting with periods of eating normally. Fast days typically involve either consuming water only, or significant calorie restriction. 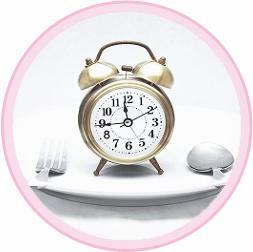 The 5:2 or ‘fast diet' approach is the most well known form of intermittent fasting. Studies have found that intermittent fasting was as effective as continuous calorie restriction for improving weight loss, insulin sensitivity and other health markers. If adopting the 5:2 diet, the person fasting needs to understand the calorific values of the foods they are consuming. This often results in an increased awareness and positively influences food choices on non fasting days. The individual can choose which days to fast in order to allow this method to work around their lifestyle. When restricting food intake, you're also limiting the opportunity to consume essential nutrients such as vitamins, minerals, antioxidants, essential fats and fibre. It's important to ensure that the general diet is as nutrient dense as possible. It's wise to consider taking a good quality multivitamin and omega 3 supplement. There are two primary methods of intermittent fasting. One method involves fasting completely, consuming nothing except water for 24-hours, on one or two non-consecutive days a week. The most common method is the 5:2 diet approach. This involves consuming only 500 calories for women, or 600 calories for men calories per day, on two non-consecutive days per week. There is no restriction on food intake for the remaining days of the week. Traditional periodic fasting involves consuming nothing but water for a period of several days. Leading experts in the field believe that in order to experience the full range of health benefits that fasting can provide, prolonged fasts should be carried out for more than three to four days. Prolonged fasting has been shown to induce autophagy - a process that helps to maintain healthy cellular function. During autophagy cells repair, regenerate and rid themselves of debris. Prolonged fasts also promote stem cell generation. Water only fasts induce ketosis during which the body switches over from using glucose (from carbohydrates) as a primary energy source, to burning stored body fat. This can be a very effective way to reduce excess body fat and reduce risk factors associated with carrying excess weight. Periodic fasting induces autophagy and promotes stem cell production that less strict methods of fasting may not. There are potential contraindications with medical conditions such as diabetes and heart conditions. Fasting for long periods of time carries the risk of low blood sugar and fainting. It's not uncommon for individuals to experience side effects such as headaches. Extended water only fasts should be carried out under expert supervision. A healthcare professional should be consulted before doing a ‘water only' fast, as it can cause harm if done incorrectly. Ideally blood tests should be run in order to rule out any underlying health issues. If fasting for longer the five days this should then be supervised by an experienced professional. Plan on drinking 2-3 litres of water every day whilst you're fasting, but space this out over the day. Avoid strenuous exercise. A concept developed by Professor Valter Longo and researchers at the University of Southern California, who have carried out extensive research into periodic fasting. Fasting mimicking diets (FMDs) provide the benefits of water only fasting but with a specially designed, plant based diet plan that does not trigger nutrient sensing pathways. FMDs are the result of two decades of research and millions of dollars of Federal funding. In studies, FMDs reduced risk factors for ageing and diseases including diabetes, cardiovascular disease and cancer. Benefits include reduced visceral fat and levels of systemic inflammation, stem cell generation and autophagy. Fasting mimicking diets provide the health and cellular regeneration benefits of periodic fasting but without having to give up food altogether. For many individuals, a programme which allows food can seem less daunting compared with consuming water alone for several days. Compared with periodic water only fasting there is reduced risk of certain contraindications. The provision of specifically designed plant based meals means that the body still receives essential nutrients whilst remaining in a fasted state. As with water only fasting, it's important to make sure that the individual has no medical contraindications. FMDs cannot be done by individuals who are allergic to the ingredients in the programme which include nuts and soya. For healthy individuals it is recommended that three FMD cycles are completed over three months initially, with 25 days off in-between cycles. After the initial three cycles, it is recommended that three cycles are completed per year on an on-going basis. ProLon is the world's first fasting mimicking diet. The five day diet plan comes simply packaged, including plant-based energy bars, soups and a variety of snacks, drinks and supplements. These are all carefully chosen to be convenient and have minimal disruption on daily life. It is important to note that fasting is not right for everyone. Anyone with an active infection or disease, a history of syncope (fainting), those taking regular medication and pregnant women should not fast unless specifically recommended to by a qualified and experienced practitioner. Although research has demonstrated that fasting can help improve blood sugar regulation, fasting should not be recommended to medicated diabetics due to the risk of blood sugar levels dropping too low. Fasting is not recommend for anyone with an eating disorder. When carried out in the right way, fasting has been scientifically proven to promote health and longevity, promote cellular rejuvenation and provide a potential solution to many of the most common diseases facing society today.